It was the year of a big birthday and with any big birthday there had to be a plan to make it more bearable. I always said I would only turn this number if I was stood under the Northern Lights in the Arctic Circle………..so that's what we did. 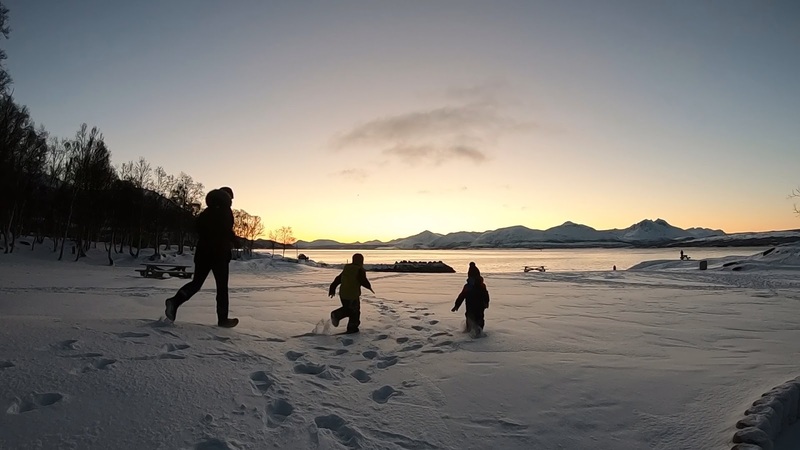 Fortunately I was born on Christmas Eve so we would spend Christmas in Tromso, Northern Norway. I wil never be able to portray the excitement that was felt since the minute we booked our flights and hotel. 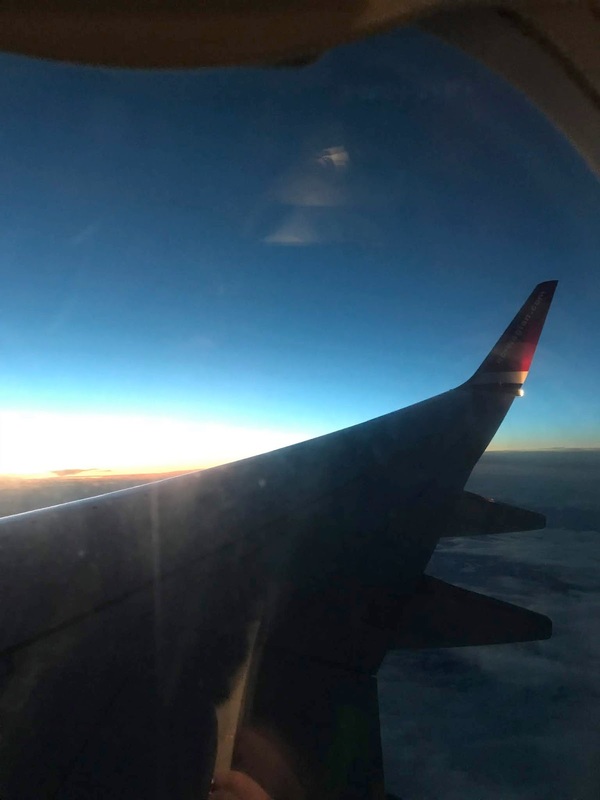 I have spent countless hours stood on cold dark winter nights with the hope of a glimpse of the Northern lights from Cumbria or wherever we are staying so to go to Norway was a dream come true. Of course lots of people told me to not get my hopes up as many go out and never see them because of the bad weather but that didn't dampen my spirit! We decided to stay at the Radisson Blu hotel in Tromso. The reviews of the hotel couldn't be more accurate. Stand off staff and not the most friendliest. Being someone who doesn't really like over familiarity or false hospitality it sounded perfect! We arrived in a snow storm and there was uncertainty about whether we could land! How we landed in that I will never know, the relief within the plane when we touched down was felt all around. The all female crew had started the holiday perfectly! We travelled in taxi to the hotel opting not to hire a car. When we walked into our hotel room our jaws dropped! The view was stunning even in bad weather and the dark. We decided to have a quick explore and find somewhere to grab some tea. As we were staying in the centre everything was on the doorstep. The boys were extremely excited and so were we! 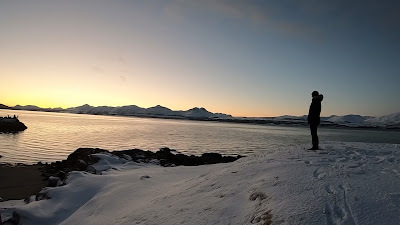 However it was soon time to get some sleep and look forward to the buffet breakfast and exploring more of Tromso. When we awoke and pulled back the curtains the view had improved further! We were all in very high spirits as we headed for breakfast. We were not disappointed! Getting used to the twilight and then pitch black by 2pm made the trip more exciting! 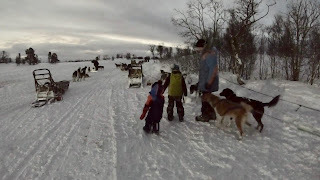 The boys were a little confused at times but soon became distracted by reindeers and dogs that we would encounter! The first excursion was up the cable car to look at the view over Tromso (which sits on an island). With multiple layers of clothes and warm snow boots we caught the bus to the foot of the cable car. At the top you could walk and admire the amazing views. 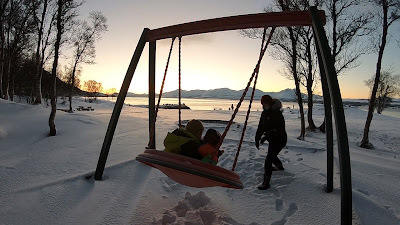 There was even a play park buried in snow and ice. This didn't stop the little men having fun! 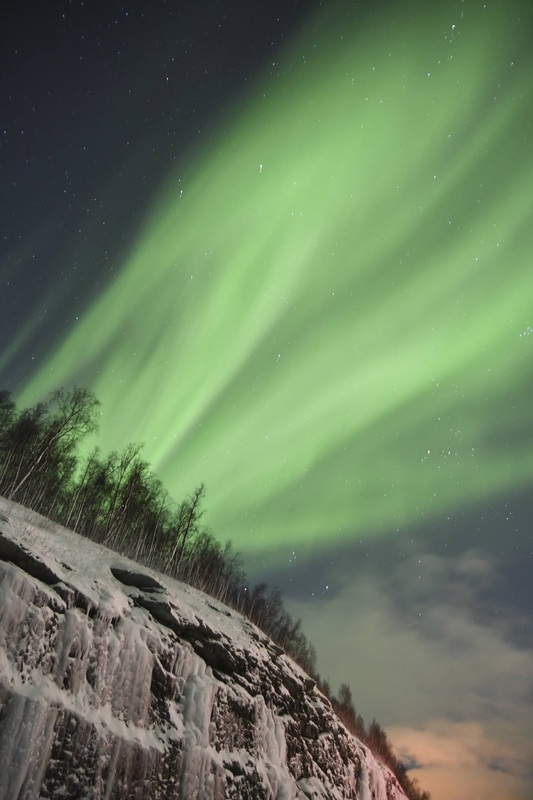 Being on the eve of Christmas Eve one of my presents was a trip with a company to chase the Northern Lights. I researched lots of companies and decided to go with Chasing Lights It was totally the right decision! The weather forecast was not great but this company really stop at nothing to give you the best chance of seeing the lights. I was dressed to withstand the -20oc temps (although the company provide clothing and boots) and was soon heading off chasing the clear skies in hope of standing under the most spectacular light show on earth as I turned….. After a few hours of driving to just off the swedish border we stopped and setup in hope of seeing a glimpse of the lights. For the next 4 hrs I stood in awe as the Northern Lights danced in front of my eyes! As midnight approached my dream of turning a big birthday under the Northern Lights had come true! We even had hot soup, hot chocolate and cake to keep us warm. 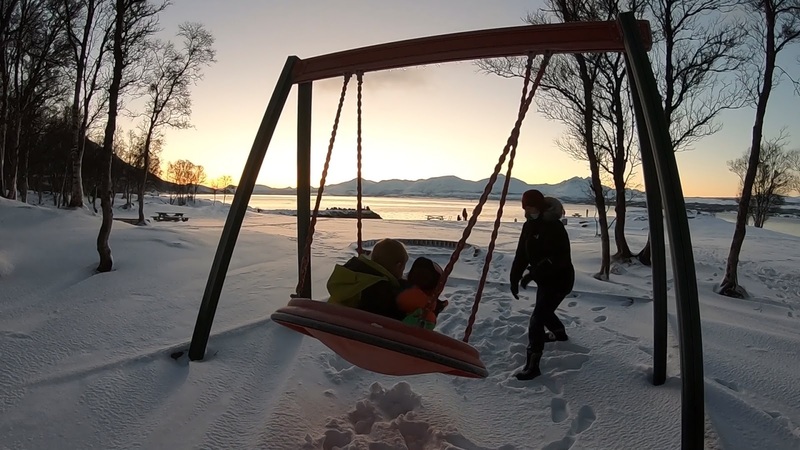 It was soon time to head back to Tromso feeling very content! I just had to wake H up (it was about 2am to show the pics!). The usual early morning wake up call was much appreciated with the rendition of Happy Birthday from the boys. Breakfast was soon over and we headed to the Tourist information to plan the next few days. First was a walk before lunch to a frozen lake! It was a very sobering experience walking past a very busy cemetery! 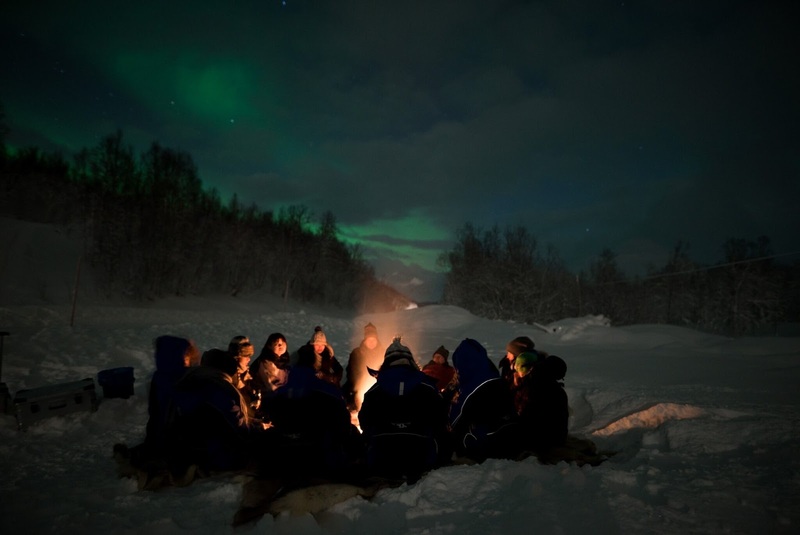 There must be some kind of Norwegian tradition but the place was filled with love and compassion not grief and despair! 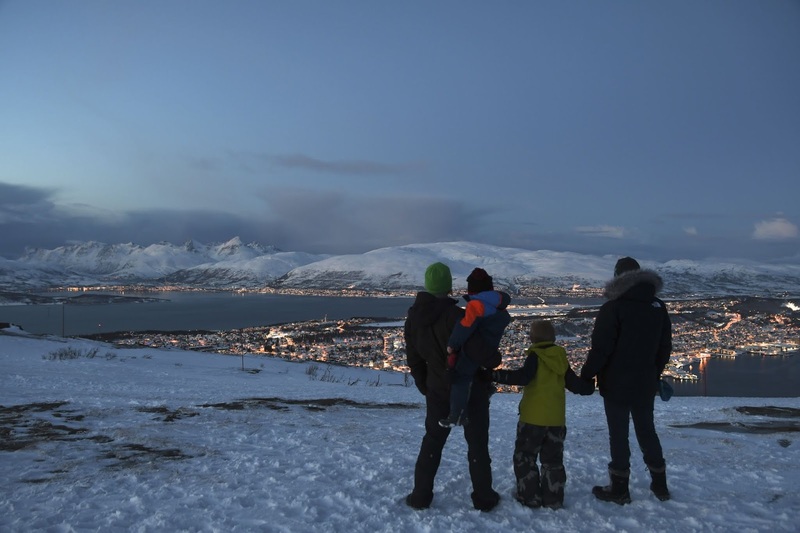 Tromso definitely oozed the traditional christmas spirit, something I think we have lost in our over commercialised world. Our Christmas Eve treat was reindeer sledding at Tromso Lapland. 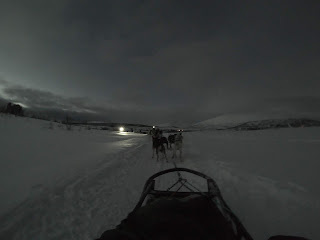 We travelled a short distance on a coach and we were soon sitting in a sled with a reindeer attached. Must admit I did feel guilty for the reindeer although they were evidently well cared for. The boys were loving the experience and as we headed out the Aurora started to make an appearance. After the sledding we were able to feed the reindeer. I must admit I was more interested in the Aurora! 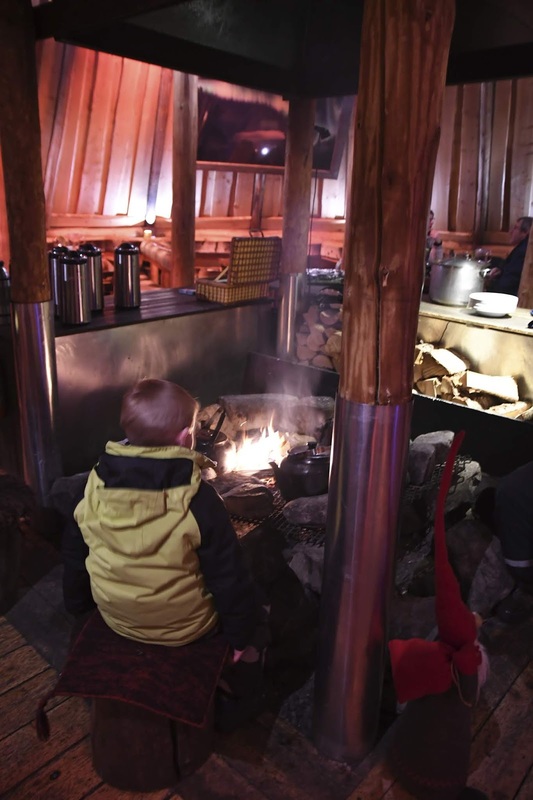 After the feeding it was back to the Sami village to experience traditional Sami food, stories and music. Again I must admit as the aurora was getting stronger I couldn't go under canvas so stayed just outside by the campfire. I couldn't believe my luck standing under the Northern Lights on my birthday again! We were soon sat around the campfire watching the best light show on earth thinking how lucky we felt. The day had certainly been one to remember. Back on the bus the boys were keen to keep tracking santa on the norad tracker. They soon started to panic when they realised he was about to land in Norway and they were still awake! Christmas morning soon arrived! After opening stockings and having a lovely festive breakfast we headed to the beach for a walk. The light and scenery was stunning. It was lovely but absolutely freezing so we were glad to get back on the warm bus and head for our christmas lunch. Unfortunately the hotel didn't offer turkey and all the trimmings but nevertheless we had fun and made up for it with our Christmas jumpers. A play in the snow in the afternoon and a wander around the town topped off a great day! As we arrived back in our hotel room we noticed the aurora making an appearance! Out came the camera as we watched it danced across the Tromso night sky. 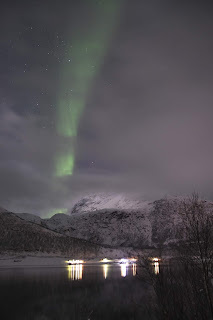 Three days out of three seeing the aurora, we were being spoilt! The eldest is dog mad so it was only fitting that we went dog sledding. Once again we boarded the bus and headed to Villmarkssenter for a bit of dog sledding. The place was amazing. 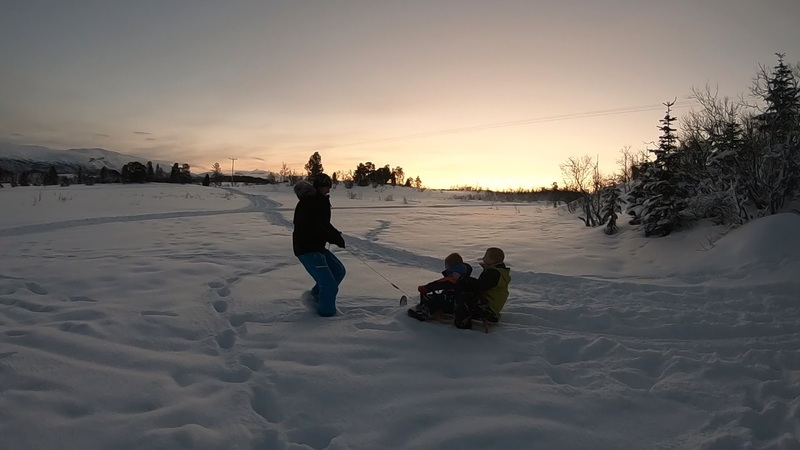 The issue we had was we would be in the dark for most of it but there was something surreal about sledding at dawn. After the sledding the boys met the puppies and then we had reindeer stew. We were then able to explore the grounds and play in the snow before being taken back to Tromso, The place was stunning! Sadly it was the last night but I was given another birthday present of another tour with Chasing Lights! I was picked up at the same place and headed off to a different place in search of clear skies. The weather was not great and hopes were fading! We managed to catch a glimpse across a fjord before hitting the road again. As we drove we were all frantically checking aurora apps and discussing the likely hood of seeing a display. Suddenly we pulled into a lay-by to witness quite a spectacular display! I really can't describe the feeling of standing under the aurora watching the display that night so here are some pics instead! Following this we moved to a more secluded place to set up a campfire and have some food. We then ventured back to Tromso but the lights once again caught the guides eye! 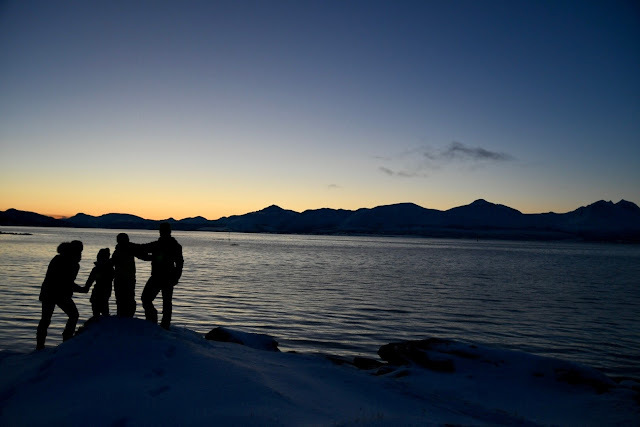 We pulled over next to another frozen fjord and watched again as the lights danced. Off back to Tromso I couldn't believe how lucky I had been with the aurora. I retired to bed very happy that night! A short taxi ride to the airport meant we were soon waiting for our fight to Oslo and then on to Gatwick. Unfortunately the little one projectile vomited all over the airport prior to boarding the plane which meant we had to plead with the captain to let us fly! We were due in South Wales for Christmas with the family so we needed to get home! A little bit of stress we could have done without but it all worked out well in the end! On the way home it was time to reflect on what had been a trip of a lifetime. The truth is I wasn't really dreading my big birthday, I always feel lucky to celebrate another year when so many people dont get that chance. I just wanted to celebrate it with the people who make up my world in a place that would inspire them one day to want to chase their dreams! 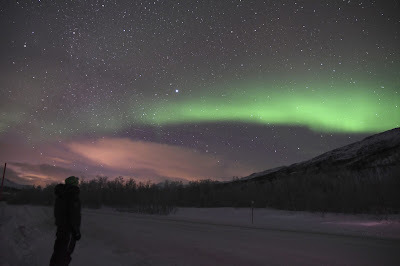 Watching the aurora dance across the sky in the Arctic Circle was certainly one of mine! A big thank you to H and my boys for really making my dreams come true!